Computer mice are becoming as plentiful as rats in the New York subway. 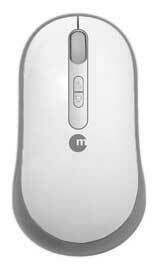 There’s a mouse for almost every type of user. MacAlly has just made the choice harder to make with their new iLaser mouse. I spent a while with MacAlly’s new iLaser mouse, and came away with mixed feelings about it. Everyone knows that mice likes and dislikes are extremely personal; what fits my hand perfectly may cause RSI (repetitive strain injury) with yours. Personal feelings about weight, click resistance, and the overall feel make it hard to believe any mouse review. Having said that, let’s take a look at the iLaser. The little rodent uses a laser for its optical tracking mechanism. This means it can track well over almost eny surface, even glass. Not having a glass desk handy, I didn’t evaluate this, but the mouse did track nicely on several different mousepads, and the unadorned surface of my desk. It’s light, quite a bit lighter than my reigning mouse-of-choice, the Kensington Optical Elite. I found it too light for my taste, as even the smallest unintended hand movements would move it. The shaping and contouring was pleasant, but people with large hands may find it virtually disappears beneath their fingers, as iLaser is somewhat small. 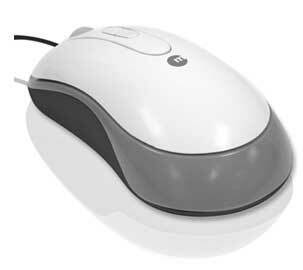 MacAlly provides custom mouse software on a CD. Installation was quick and painless, requiring a reboot after installation. MacAlly’s software pales in comparison with Kensington’s MouseWorks. You can’t adjust the tracking acceleration curves with for the iLaser, for example. Nor can you do chording with the iLaser. You can assign various sorts of clicks to the buttons, but nothing exotic. My main complaints stem from the lack of programmable side buttons. Instead of side buttons, the iLaser has the two traditional left and right click buttons, as well as a scroll wheel, and Forward and Back buttons. Unfortunately, the Forward and Back buttons, which are automatically recognized by Safari (a great touch) are located -on the top- of the mouse. They’re far enough back on the upper surface that I had a difficult time getting my index finger far enough back to click the button. My wife tried to click the Back button, and could not reach it without taking her whole hand off the mouse, as she has long fingers. After numerous attempts, I gave up trying to use the top-mounted Forward and Back buttons, as I could not easily reach the Back (the rearmost) button. In contrast, the scroll wheel was perfectly located, and had a wonderful feel to it. While small-handed users may love the iLaser mouse, especially if they don’t need high-powered mouse configuration software, I won’t give up my wonderful Kensington Optical Elite for the iLaser. The iLaser isn’t bad, but it’s not great, at least not for me.